The accompanying pic shows the cover of the book that started it all. Captain W. E. Johns was not a writer of great talent or towering intellect, but he had one great gift: he got young boys to read books. Biggles Scores a Bull, quite possibly the most unappealing title in the history of literature, was given to me as a Christmas present in 1966. I was a reader by then, but not in any enthusiastic way: if I was given a book I’d get through it without much difficulty, and sometimes I’d even enjoy the experience. 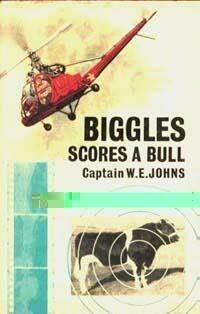 But Biggles Scores a Bull had me devouring every page as the eponymous hero uncovered a dastardly plot to … well, to do something untoward and totally unforgiveable to bulls. Honestly, nearly fifty years later I can’t remember the details of the plot, but I absolutely remember the feeling of not wanting to put the book down, of simultaneously wanting two mutually exclusive things: to know how the story ended but not wanting the story to end – ever! I think anyone who reads more than casually, especially anyone who reads novels, knows exactly what I’m talking about. For some it happens the first time they read The Lord of the Rings, or Dune, or Pride and Prejudice, or The Satanic Verses, or White Teeth, or even Biggles Scores a Bull. There is one novel that gets you so wound up in the story and characters that you live in that world for the duration of the readin g, and from that time on you will read until your dying day so you can recapture that experience again and again. From that Christmas in 1966, I read all the books about Biggles that I could lay my hands on, completely oblivious to their casual racism, sexism and repetitiveness. The day came, of course, when I ran out of Biggles books to read. That’s when I made a momentous discovery in my school library: Johns also wrote science fiction. At that age – I was 10 or 11 – I knew what science fiction was. I just didn’t know it was called science fiction. I watched with a great deal of pleasure Superman, Dr Who, Stingray, The Twilight Zone and films from the 1950s about bug-eyed monsters and rocket ships with huge fins. I was even writing science fiction by then, but wasn’t aware I was writing inside a genre. I was simply writing what I loved to watch on television. Learning that Captain W. E. Johns wrote it as well was for me a revelation. Johns wrote a total of ten sf books. The first was called the Kings of Space. I read it in a day. The library had two other books in the series, and I read them in the next two days. And then I discovered an Australian writer Ivan Southall, who had written a series of almost exclusively SF books about an Australian pilot called Simon Black. I was reluctant to desert the sinking Captain W. E. Johns, but there was no other flotsam on the horizon. Southall is a better writer than Johns, I think, even in his earlier books. More importantly for 11 year-old Simon Brown, having a protagonist named Simon Black obviously meant I was destined to read these books. Soon after, I discovered the works of Robert Heinlein, Andre Norton, James White, Michael Moorcock, Leigh Brackett, Anne McCaffrey, John Brunner, John Wyndham, Arthur C. Clarke, Ray Bradbury, Ursula K. Le Guin and Isaac Asimov. I fell in love with the works of an entire genre, not just the works of a single author. The clincher happened when I was thirteen. We studied The Lord of the Rings as part of the English curriculum. I learned that science fiction was part of a much broader genre now called speculative fiction that included fantasy and horror and a whole lot of stuff that falls between literary stools, and I have been reading it ever since. Biggles may have scored a bull, but I scored a lifetime of reading.